Right now, the whole world is printing money, while one USD has drop to a record low of 1.217 versus SGD. The sycophantic mass media will praise "strong SGD" in lock step, ignoring the fact that SGD itself has also plunged a record low against gold. The days of fiat currency is numbered. While some of the more responsible elite in certain countries has spoken publicly about protecting their citizens against currency debasement, nothing of this sort has come out from PAP. 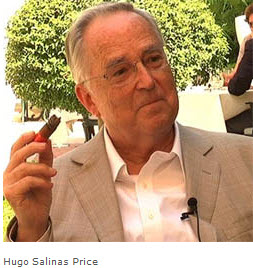 Below is a masterpiece by the respectable Hugo Salinas Price, regarding the re-monetization of silver. If LKY is able to be the first do that, he will be remembered not only in Singapore, but throughout the whole world, as the hero who defeat USA imperialism. The Dollar Vigilante (TDV): Thank you very much for taking the time to speak with us today! Please introduce yourself and give some background on yourself to our audience. I decided to devote myself to some productive work at age 20 and so I am mostly self-educated. As luck would have it, I managed to build a tiny company building radios into a chain of small stores selling durable consumer goods in installments to the public. After 38 years of one single job, I turned over management entirely to my eldest son, and he has been very successful, indeed. It's certainly not my fault I am considered a "billionaire" - this was my eldest son's doing, he is to blame for it entirely. However, monetary affairs have always fascinated me, and in "retirement" I was able to devote myself to thinking through the problem of instability in modern society. Thus, I arrived at the question of silver money, in 1995, when I wrote a little book "Silver - The Road for Mexico" (available only in Spanish). Thus began the long journey which has given meaning and purpose to my old age. TDV: Where in Mexico do you live? HSP: I live in Mexico City, same house since 1959. TDV: You have been very active in lobbying the Mexican Government to integrate silver into the money system. Could you please expand on this? HSP: First, I want to make it clear that my campaign for silver does NOT mean backing the Mexican peso with silver. I am not proposing anything so radical as a general reform of the Mexican monetary system - simply because such a program would cause so much disruption and grief while people adapted to it, that it is politically impossible; and so it is useless to spend time working on something so "far out". What I propose is simply to give a quoted monetary value to a one-ounce pure silver coin which already exists, the "Libertad" ounce (editors note: Libertad means freedom in Spanish). This coin has no engraved value upon it, and it would be given a QUOTED monetary value by the Central Bank; the quoted monetary value would always be slightly higher than the market price of a silver ounce, and when the price of silver rises, the Central Bank is to adapt to that situation by giving the coin a higher price. When the price of silver falls, the last quote remains in place, so that the quoted value can never diminish, only rise to accommodate the higher market price of silver. By this means, something very important would happen: the silver coin would remain permanently in circulation with paper money; the silver coin would never be melted down, because higher prices of silver would simply mean a higher monetary value for the coin. Of course, people would save these coins, the demand for them would be enormous. But they could also use these coins for payments in emergencies or for investments. An excellent and simple way to save! There is in the world today, no real alternative to fiat money - fake money. All currencies of the world are equally void of any intrinsic worth. Monetizing the "Libertad" ounce would give Mexicans an alternative and simple way of saving, in money that is truly money, because it is made of silver. Savings in "Libertad" ounces would provide every family with a nest-egg of great importance, as it would consist of coins which cannot be devalued by the State, with a totally liquid value. TDV: OK, this clarifies things a lot. So, your goal here is not to fully back the Peso with silver. HSP: Yes, as I said before, I am NOT for "backing the Peso with silver". I am striving to have a single silver coin, the one-ounce pure silver "Libertad", MONETIZED by means of a monetary quote to be issued by the Central Bank. The Government of Mexico, just like the Governments of every single country in the world today, allows the Central Bank to inflate the money supply through the banking system. Not one of the world's governments is ever going to willingly stop inflating! The monetized one-ounce pure silver "Libertad" will provide an excellent refuge for savers who want to preserve the value of their savings for their old age, for the education of their children, or simply to eat when hard times strike. It would be the first and (for a time) the only true alternative money in the world of the 21st Century. TDV: In other words, the Mexican central bank can keep inflating under this proposal. HSP: Neither the Mexican government nor ANY GOVERNMENT IN THE WORLD will ever swear off of inflating the money supply and expanding credit when it can be done. That's why we need the alternative money, which can be said to be "indexed" to the market price of silver. TDV: Why would the Mexican government give the “Libertad” a quoted monetary value? Does this mean that someone can pay a certain amount of pesos for the coin and then, if the peso value of silver halves, they can sell it back to the Central Back for the same price that they purchased it for? Wouldn’t the Central Bank have an incentive to print enough money so that the peso value of silver never falls? HSP: The institution giving the coin a quoted monetary value would not be the Mexican government, it would be the Central Bank, in obedience to Legislation passed by the Mexican Congress, which has the constitutional authority to instruct the Central Bank on this matter. About "selling the coin back to the Central Bank" for the same price they paid for it, when silver has fallen in bullion value: Yes, they could, but no one in his right mind would do this. The Mexican peso which circulated for 25 years (1920-1945), of which 458 million were minted, contained silver which fell in value sharply during the Depression, yet not one of those pesos was ever returned for PAPER. Gresham's Law, you know. No one ever exchanges better money for worse money. Printing pesos to keep the peso price of silver up, means inflating and devaluing the peso against the dollar, in which currency silver is quoted in world markets. The Central Bank would have no reason to do this. TDV: We have been debating your proposal amongst some members of the Austrian economics community. Some state that silver is too volatile to use as an alternative currency at this time… they prefer gold. What are your thoughts on using silver versus gold? HSP: The monetization of the silver ounce would cause a demand for it that would tend to smooth out the volatility, which I suspect in any case is due to manipulation of the silver market. The best way to combat that manipulation is to create a great demand for physical silver which would put the shorts out of business. Talk of a return to gold is important, as it fosters a re-orientation of thinking which is indispensable - from the paper of the last 40 years, to gold, that will give more long-lasting benefits to humanity. Eventually, we'll have to get past the "talking" stage and move on to action; however, no one has a clue, at this point, on how to get from paper to gold! Monetizing the silver "Libertad" coin is a FIRST STEP IN THE RIGHT DIRECTION. It does not fix everything, it does not reform everything, it is painless and it is very, very attractive to people. This, my friends, is the only practical way to get anywhere in life! To quote an old, old song, "I don't want to set the world on fire, No baby, I'm contented - with a flame in your heart". TDV: Nice touch. Just for the record, we here at TDV are fully in favor of setting the monetary world on fire if need be to rid ourselves of these central banks and governments! But we also appreciate the prudence in taking it one step at a time as you are attempting to do with the silver Libertad. On other matters, we recently wrote a blog piece about the vibrancy of the Mexican economy (The Rumors of Mexico's Death Have Been Greatly Exaggerated). What are your overall thoughts about the state of Mexico and it’s economy? HSP: We're looking great, considering the fiscal chaos in the USA with its $1 Trillion-plus budget deficits as far as the eye can see. We need to have our people save lots of silver, to face the coming readjustments in the US economy, which will be very painful, indeed. TDV: Thank you very much sir for your time and your efforts to try to bring some sort of sanity to the monetary system. With BullionVault you are able to purchase physical gold and silver bars at current spot exchange rates. Your gold and silver may be stored in one of 5 secure global vaults. And you are able to trade it online or withdraw physical bars.